While this is not a long backtest, we see that the results are consistent with prior results on the Dow 30 tests and also with what we would logically expect: 1) Cluster Risk Parity is the best performer in terms of risk-adjusted returns (and also annualized returns in this case) 2) dynamic clustering outperforms static clustering in terms of both returns and risk-adjusted returns 3) static clustering outperforms non-clustering and all clustering methods outperform non-clustering in terms of returns and risk-adjusted returns. 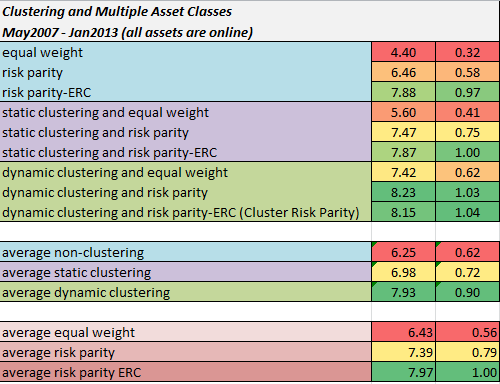 To further break things down, we also see a logical rank progression based on the risk allocation method: 1) All risk parity variants outperform equal weight in terms of returns and more importantly risk-adjusted returns 2) risk parity-ERC outperforms the more basic risk parity methods- which do not make use of the covariance information. In this dataset, all of the rankings show a greater separation in terms of magnitude than on the Dow 30 tests, which can be expected since assets are less homogenous than stocks. In general, the purpose of these tests is to show the importance of dynamic clustering and also more precise risk allocation methods in portfolio management. The combination of these two methods leads to a superior risk control and risk-adjusted performance than either in isolation. While the performance improvements are somewhat modest, they are fairly consistent and also more importantly make the portfolio allocation process less sensitive to unfavorable variation arising from universe specification. In fact, it is possible (with some refinement in these methods) to avoid having to carefully pre-select a universe in the first place. This leads to backtest performance that is less likely to be inflated in relation to out of sample results. In a perfect world, we would want to input a large universe of liquid tradeables and have a self-assembing optimization and allocation process with multiple layers based on a set of pre-specified constraints.